It’s often said big things come in small packages, and in this case it’s very true. To celebrate the 30th anniversary of the Wörtherseetour, an annual even that attracts Audi, Seat, Skoda and Volkswagen enthusiasts Audi has created a no-holds-barred version of their A1. 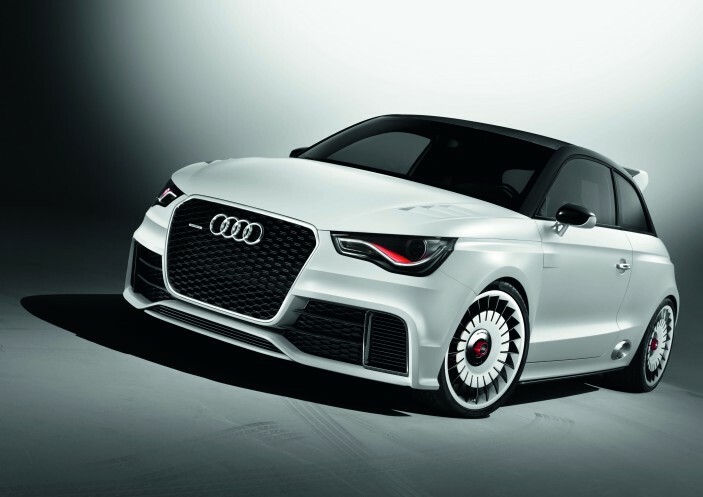 The one-off Audi A1 clubsport quattro is sure to be the envy of Audi drivers everywhere. The 503 hp and 486.79 lb-ft of torque emanating from under the hood come courtesy of a highly-modified version of Audi’s 2.5-liter 5-cylinder engine, with turbocharging and direct injection. All of this horsepower and torque is made more evident because of the car’s reduced weight. Weighing only 3,064 lbs, the A1 clubsport quattro can accelerate from 0-60 mph in 3.7 seconds, from 0-125 mph in 10.9 seconds, and 50-75 mph in fourth gear in only 2.4 seconds. All of this horsepower and torque is transferred to the wheels via a six-speed manual transmission and quattro permanent all-wheel drive. Speaking of wheels and tires the special A1 rolls down the road on 255/30 low profile tires with 19-inch alloy wheels, and comes to a stop via six-piston calipers and perforated carbon fiber-ceramic discs on the front, and steel discs on the rear. In order to save weight many luxury items have been removed including the rear seats, infotainment system, MMI monitor and loudspeaker, making the vehicle more suitable for the racetrack. To round out the weight savings the A1 clubsport quattro has lightweight bucket seats taken from the Audi R8 GT and feature a chassis made of carbon fiber-reinforced polymer. The interior and exterior of the A1 clubsport quattro have also been tweaked. The exterior is finished in matte white with many accents to separate it from everything else on the road. Included in these accents are a high-gloss roof arch with carbon fiber-reinforced polymer (CFRP) roof underneath. The aerodynamics are highlighted by large, split air intakes with carbon struts, integrated into a modified front skirt. The front fenders, doors and rear side panels have been widened by a total of 60 millimeters and air outlets are integrated into the rear ends of the fenders. The interior is also race-inspired with exposed, matt-finished CFRP throughout. Additional instruments let the driver keep track of the oil pressure, boost pressure and electrical system voltage and red loops have replaced the handles on the doors, the glove box and the covers of the storage compartments.